Greta Cahill never believed she would leave her village in the west of Ireland until she found herself on a ship bound for New York, along with her sister Johanna and a boy named Michael Ward. Labeled a "softheaded goose" by her family, Greta discovers that in America she can fall in love, raise her own family, and earn a living. Though she longs to return and show her family what she has made of herself, her decision to spare her children knowledge of a secret in her past forces her to keep her life in New York separate from the life she once loved in Ireland, and tears her apart from the people she is closest to. Even fifty years later, when the Ireland of her memory bears little resemblance to that of present day, she fears that it is still possible to lose all when she discovers that her children—with the best of intentions— have conspired to unite the worlds she’s so carefully kept separate for decades. 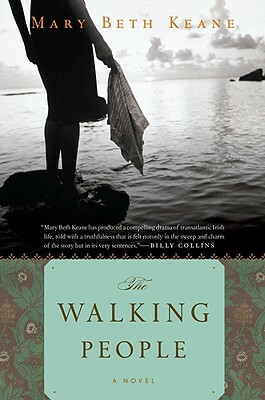 A beautifully old-fashioned novel, The Walking People has remarkable range and power. MARY BETH KEANE attended Barnard College and earned an MFA from the University of Virginia, where she was a Henry Hoyns fellow. She was a winner of the Chicago Tribune’s Nelson Algren Prize in 2004 and was a 2005 Pushcart Prize nominee. Michael Ward comes from a “tinker” family of travelers. Greta and Johanna are “country people” who are settled down. What do you think about each group’s attitude toward the other’s way of life? Early in the book, the family discovers that Greta needs glasses, and when she puts them on she notices that “the world looked slightly different” (p. 44). Later, Greta and her family witness the electrification of the city, and in their newly illuminated house they can see cobwebs never detected before. How are these two details symbolic of Greta’s shift in worldview when she moves to America? Identify other events of Greta’s life that affect her perspective. What is the significance of Shannon’s visit to Ireland from New York City? What do you think it means that her departure left a big hole “shaped just like America” (p. 97)? Michael’s father once told him that women with secrets age too fast (p. 255). Based on the women in The Walking People, would you agree? On the family’s last evening in their apartment of twenty-two years, Julia discovers the old letters from Aunt Johanna—and discovers a secret about herself. Why do you think she decides to keep her knowledge of this a secret? Do you think her discovery changes the way Julia feels about Greta? As Michael prepares to retire, his family and coworkers have noticed subtle signs that he may be developing Alzheimer’s. Why is this significant, in light of the fact that Michael believed secrets could age a person?